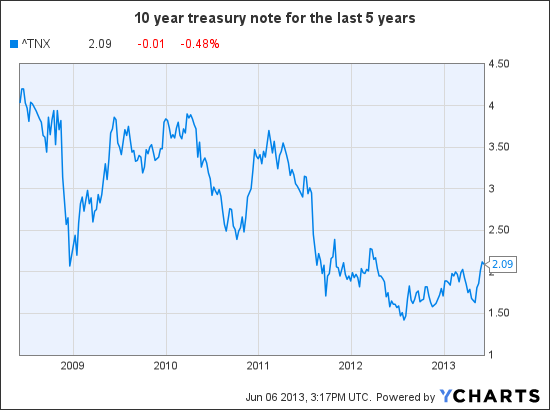 Are bond yields about to flip out? It has become something of a truism in the financial press to point out that bond yields "can only rise" from here; this kind of statement is generally paired with an explanation that when bond yields rise, bond prices fall and will therefore hurt a portfolio holding bonds. The purpose of this post is not to suggest that bond yields won't rise in the near or distant future, or to make counter claims about rising yields and accounts holding bonds...what I seek to do here is offer some context and perspective. The last 6 months have shown a good bit of volatility, and end to end over that time the yield on the 10 year treasury has risen about 30% from ~ 1.6% up to 2.09%. No doubt that is a material move - in very general math that rise in yield would make the price of the 10 year bond fall by about 4.4%. Similarly, when the rate fell in the middle of the above chart, from just over 2% down to around 1.65%, bond prices would have risen significantly. What does it look like if you take a big step back? In this 5 year view, the recent pop-up in rates still looks big, but relative to some of the other bounces up and down it is relatively benign. That precipitous drop and subsequent spike in late '08 and early '09 represents a massive swing in value, on the order of ~ 15 - 17% of the value of the bond. The main takeaway here is that interest rates are volatile, and that volatility impacts the value of portfolios holding bonds. What it doesn't mean is that bonds are necessarily too risky or a bad investment for certain clients; again, every investment option should be evaluated based on expected risks and returns within the investor's specific goals and time horizons. the lower quality the bond (high yield or junk bonds are on the opposite end of the spectrum from US Treasuries or high grade corporate bonds), the less sensitive the price / yield is to market rates and more sensitive they are to economics. 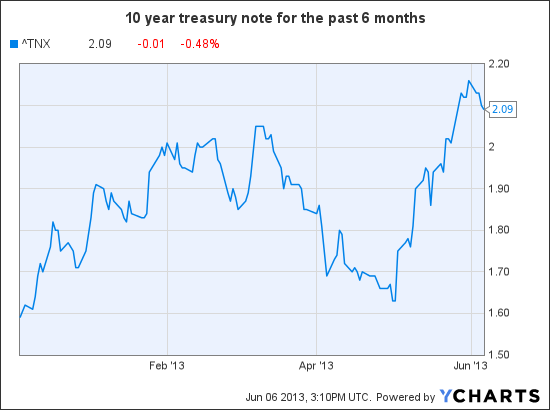 Put another way, lower quality bonds tend to show more correlation to the stock market than to treasury rates.